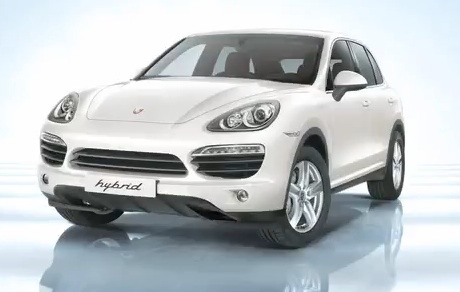 Green Overdrive: The Porsche Cayenne S Hybrid! It may not be the greenest battery-powered car we’ve driven (at between 21 to 25 MPG) but it’s a Porsche and “its got the same performance and acceleration of a Porsche,” (150 mph top speed, and 0 to 60 in 6.1 seconds) as Gary Fong product manager for Porsche told ius in an interview for our Green Overdrive show this week. But it also has some nifty green features, like how you can drive on electric power up to 37 miles per hour, and then while you’re going between 75 to 80 mph the power kicks off and you’re basically coasting (check it out on our test drive video). It’ll also cost what a Porsche does = $67,700. Great job on the report, it was educational! Over the past few years Porsche has been getting some credit for making cars that have a long life time due to exceptional build quality. When something breaks its crazy expensive to get fixed outside of warranty. I work with a few guys who drive a Porsche for the attention it brings and hate that aspect of what Porsche comes with. This Cayenne S Hybrid has luxury items I don’t need but I drive under 40 MPH my entire 30 minute work commute and if I knew this could be my vehicle for 15 years it’s nearly perfect. Too bad it doesn’t have a manual transmission though it would negate the coasting technology. Thanks for the report and great work! What does this car? have to do with ‘GREEN’? $67,700. That is over three times my retirement pay! My Toyota Prius 2007, bought it Nov.06 has averaged 41.852, I keep track of all my cars on EXCEL since forever….I do not drive slow, I do not take off like a tortise, if you pass me your breaking the law..I now have 85,000 miles and have choice, try to make a deal or see how long it will run…At 71 I don’t wish to blow my burial fee! @Nick F. On the length, yeah it’s been an editorial decision to keep them around 5 minutes. But thanks for the thoughts on going longer, I’ll discuss it with our video team. I definitely think that more outside driving shots of the cars are in order – will push for that. On my sister, her website team decided to go to the detroit auto show and we didn’t so I thought I’d just republish them here. Won’t likely be a routine thing, but they did a good job. I watch all your car/bike reviews, but I’m always left wanting more. Are they always short because your not given much time with the car or because of an editorial decision about their length? I appreciate that short works for the web and your vids get posted on a lot of blogs and that works for you guys. More more more though. …If possible. :-) Maybe some exterior shots as your driving around, and a slightly longer discussion with the car person the company sent out to talk to you. I do appreciate that that could cost more and would need more time to film. I also appreciate that the representatives they send out are not always that knowledgeable about the technology…although sometimes they are. Per the interview, potential fuel savings can be achieved through the vehicle coasting at high speeds (75-80 mph). Isn’t this way above speed limits in the US? Really it is even a selling point, when users have to start speeding to get additional fuel savings? Just curious if I have comprehended this incorrectly? @Rich, sorry sentence is meant to say “as Gary Fong product manager for Porsche told us in an interview for our Green Overdrive Show.” fixed. Sorry to complain, but what kind of sentence construction is that?